Learn more about Eastern Shore Porch & Patio! What makes a house a home? Is it the square footage of the space? Or is it the photographs mounted on the walls? However you define “home,” it’s important that you make it yours. Eastern Shore Porch & Patio has been helping clients in the Delmarva Peninsula area turn their house into a home for more than 26 years. Learn more about this local business! Eastern Shore Porch & Patio has teamed with Eastern Shore Vinyl Products to provide premier vinyl fence products, vinyl rail products, and three or four-season enclosures to the Delmarva Peninsula area. Our professional team of experienced installation and vinyl fence sales staff is ready to hear your needs and transform your dream into a reality. We offer the highest quality materials, each with a lifetime warranty against cracking, peeling, or fading. Eastern Shore Vinyl Products has a 15,000 square foot fabrication facility for the homeowner who likes to complete their home improvement projects themselves. We offer all the materials that you need to complete your project, rather than selling you a box of parts that you don’t need. With competitive pricing and dedicated local service, we’re ready to take care of all of your home improvement needs. We offer a comprehensive range of quality vinyl fence products, as well as versatile installation options for residential and commercial properties. All of our fencing and railing products come with a lifetime guarantee and a full one-year guarantee of workmanship. What’s more? We provide excellent customer service to every client! Learn more about our fence options. The American dream isn’t quite complete without the white picket fence. If picket fences are the best choice for your home, Eastern Shore Porch & Patio can provide you the size and design to fit your aesthetic. We provide a variety of designs such as arched, straight, or dipped fences as well as multiple sizes to meet your needs. Are you still on the fence? One of our experienced team members can help you determine which picket fence is best for you. Don’t open your pool this summer until it’s safe for your family and visitors. Eastern Shore Porch & Patio provides a variety of closed rail fences for added strength and security to your pool or other areas of your property. An additional aluminum reinforcement ensures that your closed rail fence is completely secure. Are you looking to increase the privacy level of your property? Do you want more privacy but don’t want to block the sunshine or pleasant sea breeze? Eastern Shore Porch & Patio offers semi-private and privacy fencing to provide our clients with exactly what they need. Our semi-private and privacy fences can be customized with lattice, picket, or dentil tops to fit your home’s aesthetic. Our privacy fences have additional aluminum reinforcement on the bottom rail and a ribbed top rail for added protection and style. Ranch rail fencing provides the perfect solution for the homeowner with horses, cows, or other livestock. They’re made with durable rails and posts to withstand the elements, and each product comes with a lifetime guarantee! We also offer a variety of other fence materials and options such as aluminum fences, chain link fences, and wood fences! Eastern Shore Porch & Patio provides aluminum and vinyl railing options for residential, commercial, and industrial properties. Our aluminum railing products are designed to work perfectly with our aluminum fence products, so the installation process is seamless. We handle iDeal aluminum railing products including iDEALRAIL riveted, rackable railing systems for on-site aluminum fence installation. Eastern Shore Porch & Patio offers pergolas, shower enclosures, and trash enclosures to improve your outdoor space. We use the same quality vinyl that distinguishes our other products, and our outdoor living products can be ordered in a variety of sizes and styles. Pursue our gallery of outdoor living projects! Screen rooms allow homeowners to enjoy the benefits of the outdoors without the fear of bug bites and other annoying factors. The Eastern Shore Porch & Patio team provides expert screen room construction and installation. Our expert installers understand how to customize screen rooms to fit your home’s specific exterior. You can count on us to do it right the first time! Eastern Shore Porch & Patio is a proud installer of Eze-Breeze enclosures and products. Each Eze-Breeze enclosure is designed with lightweight, vinyl-glazed panels that can be modified and easily stored. Our team can also install a wide selection of glass windows including replacement windows and durable hurricane windows. What better way to enjoy the view of your landscape than to relax underneath the covered porch? Eastern Shore Porch & Patio provides a variety of elegantly covered porches in a multitude of styles, sizes, and colors to fit your home’s aesthetic. It might be winter on the East Coast, but spring will soon be here! Take advantage of the warm temperatures and sunny skies and call Eastern Shore Porch & Patio for deck installation services. Our team is the preferred wood deck and composite deck installation company of Delmarva! Wood decks are a favorite choice for homeowners throughout the Delmarva Peninsula area. Not only is wood a classic material, but it’s also durable and requires minimal maintenance. Eastern Shore Porch & Patio has countless years of wood deck installation experience, which means that you can count on us to do the job right. Composite decks are gaining popularity due to their attractive appearance and resiliency. We use Armadillo composite decking, an environmentally-friendly alternative to wood! An outdoor living space isn’t complete without certain accessories. Have you ever spent an evening reading on the deck, only to discover that you can’t see the pages once the sun sets? With accessories like LED lighting, you can enjoy your outdoor space at any hour of the day. Peruse our full accessories catalog, and call us with any questions you might have! Our experienced team is looking forward to hearing from you. 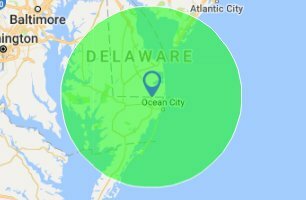 Eastern Shore Porch & Patio is proud to be the premier vinyl fence sales and vinyl fence installation company for the Bethany Beach, Ocean City, Lewes, and Delmarva areas. Request a quote today! This entry was posted on Friday, February 9th, 2018 at 1:11 pm. Both comments and pings are currently closed.